List of South Sea Islander School Children, Pleystowe, Walkerston and Dumbleton Schools, Mackay. Noted are ages, grade, school and remarks about where the children live and how they get to school. 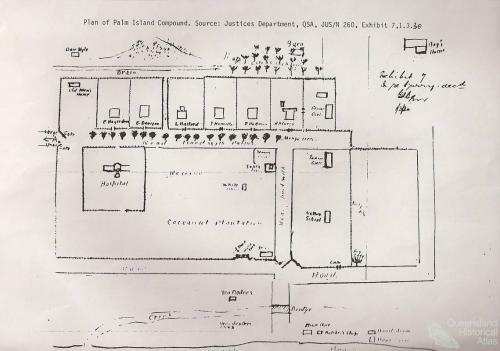 Plan of Palm Island Compound, Justices Department, 7 January 1931. Collection of Queensland State Archives. Palm Island compound (1930) built on the principle of segregation akin to apartheid. Palm Islanders were banned from entering tree lined Mango Avenue where white staff members were housed.